Sunday morning Alan and I headed back out to the tower to survey the course, and then Alan went back to the Pits because he was driving this meet. There were only about 80 entries so it was a pretty small meet. Because of our very poor May meet Alan’s run wasn't until fairly late in the first round of cars. Mark pushed Alan up to speed, and Alan rolled the throttle on very slowly since he'd broken the drive hub in first gear the last time he'd driven. He got quickly to 10,000RPMs in first and second gear. In third gear at full throttle, he pressed the Nitrous button and the extra power came on instantly, but the car had a very noticeable high frequency vibration. Alan let off the Nitrous to see if that was the cause. The power dropped off, but the vibration was still there. Alan tried wiggling the steering to see if the car was still handling properly, and it was, he varied the throttle to see if the motor still felt good, and it did, (you'd be amazed at how much you can feel the motor while belted into the car). All of this was going on at over 110 mph. The vibration seemed like it was there to stay, but without any immediate problem and wanting to actually complete a run, he went back onto the Nitrous. In forth and fifth gears the Nitrous got the car quickly to 10,000rpms. With the delay in third, the car didn't get to the planned 10,000 in sixth gear before the finish. Alan got a speed of 176mph, Alan’s fastest run in the dirt, and our third fastest run at El Mirage. After the chute was deployed, and the motor shut off, the vibration was still quite strong. Alan guessed that for some reason the chain was very loose. When Mark arrived with the push van, they talked about the vibration. Mark noticed that the exhaust pipe was sticking out of the car by half an inch, (it is normally flush That was not a good sign. Back at the pits they removed the engine cover and saw that the chain was extremely loose. Both chain guards suffered a little damage, but they did their jobs and protected the rest of the car. It turned out the motor had enough torque to twist itself out of the upper motor mounts and pivoted on the lower mounts enough to move the drive sprocket back about an inch. Fortunately there was no real damage to either the car or the motor. In the afternoon, I, (James) took a break from working in the tower to pull Mark’s afternoon patrol. The next weekend, Alan and I drove down to Mark’s house to see what we could do to prevent this from happening again. When all of the bolts were loosened, the motor dropped right back into place. 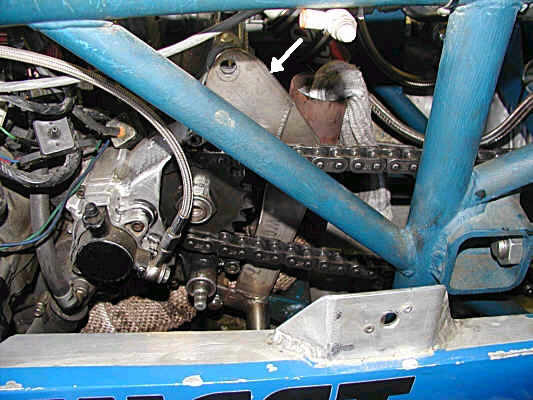 The cause seems to be that the bottom motor mount has a double pivot, and the top motor mounts have been slotted to allow for different mounting heights, and to make installation easier. The Fix: We decided to add a second arm to the lower mounts, removing one of the pivot points, and add a strap mount to the front of the motor to prevent it from raising up. The new motor mount is the stainless steel bracket just to the right of the sprocket. In other news, Alan and I are packing for SpeedWeek. We provide the timing equipment for the meet and it is all new gear this time. The new clocks are accurate up to about 10 parts per billion, (off by less than a second in three years). That has meant that Alan has spent much of his free time this year designing, building and testing the new clocks, and I’ve spent quite a bit of time programming the computers to work with them. Patrick Vigeant has expressed an interest in going back to Bonneville with us this October but there are still slots available on our crew roster.